The Zoo regrets to announce one of its southern black rhinos, Brewster, was euthanized on March 19 due to a health condition. He was estimated to be 33 years old, and resided at the Zoo on exhibit with companion rhino, Mimi. During his time at the Zoo, he sired three surviving calves. 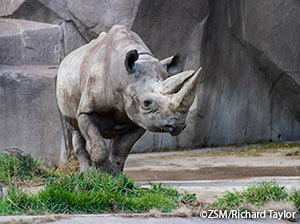 The median life expectancy for black rhinos living in zoos is 17.8 years. Brewster abruptly stopped eating, was showing signs of colic (abdominal distress) for about a week; he was treated and monitored by veterinarians and keepers. Despite treatment, he showed no signs of improvement, and the difficult decision was made for him to be euthanized. Necropsy results (an animal autopsy) showed a hay impaction of the colon due to age-related dental disease. The Zoo’s medical staff had been treating Brewster for dental issues for the past several years. Complete microscopic results will be forthcoming. Brewster was one of two southern black rhinos brought to the Zoo from Zimbabwe in 1989 in accordance with the Rhino Specialist Group and Species Survival Plan® recommendations. A favorite animal of Zoo staff and visitors, Brewster will be sadly missed. The southern black rhino once roamed most of sub-Saharan Africa, but today is on the verge of extinction due to poaching fueled by commercial demand for rhino horn.